Nobody talks about other groups that also joined forces with the Nazis because to do so, would distract from the main aim of creating hate against Muslims, especially since the largest collaborators were Jewish. Nevertheless, examples abound. The most famous was “Netaji” Subhas Chandra Bose beloved and respected even today, by most Indians, Pakistanis and other South Asians for his steadfast opposition to the British. He led the Indian National Army under his slogan ‘Jai Hind’ and fought the British during WWII with help from the Germans and the Japanese. There were other groups, also desiring freedom from the British or other yokes who also supported the Nazis because of the promise of later independence. The one group that is rarely if ever, brought up for discussion, are the Jews who collaborated with the Nazis. This is not a small number of Jews who collaborated because of personal gain such as the Jew-hunting Jews who identified German Jews hiding in Germany and elsewhere. No, these are highly-organized groups who negotiated with the Nazis (NSDAP or, “The National Socialist German Workers’ Party“) and actually signed compacts like “The Haavara Agreement“. The Nazis would permit Jews to leave and settle in Palestine and these groups would purchase German goods and products that the resettling Jews needed in Palestine. This Haavara Agreement remained in force, sending much critical treasure to the Nazis and bringing about 60,000 Jews to re-settle in Palestine under the auspices of a Jewish citrus company in Palestine called ‘Hanotea’ (The Planter”). 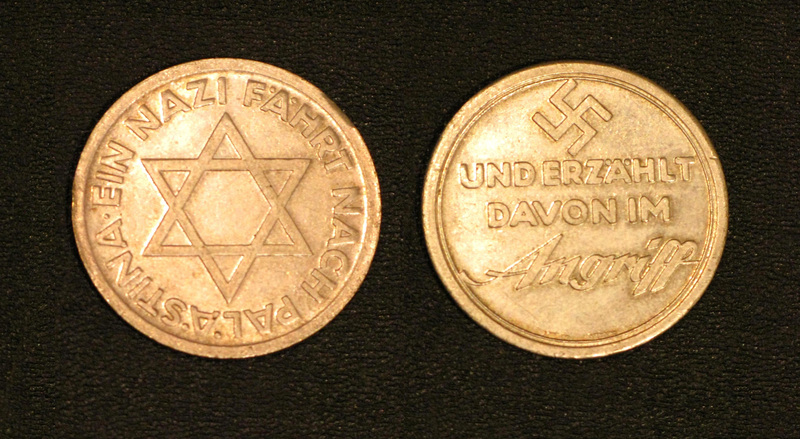 Medals were struck, commemorating the Agreement between the Jews and the Nazis. Avoided too, are the many attempts for collaboration of the Stern Gang (Lohamei Herut Israel – Lehi, “Fighters for the Freedom of Israel) with Nazi Germany…also in exchange for bringing more Jews to Palestine. Today these same “Freedom Fighters are honored by the issuance of a military decoration called “the LEHI Ribbon”. Nobody seems to want to bring up this end of the repugnant discussion of Jews collaborating with the Nazis, perhaps because the focus against Muslims…the Bad Guys of today’s fashion, could be lost. My thanks to my friend Richard Silverstein, publisher of Tikun Olam, for pointing me in this direction. An excellent and informative article. Thanks for sharing it. Season’s greeting to you and your family, Jaffar. Thanks for an excellent and informative article. By the way, it seems that you meant Nazis instead of Israel in the first line of second para. If so, please, correct this. You were absolutely right, thanks! Rectified now.